The Jet-Kleen Blow-Off Gun provides a safe and highly effective means for removing residue such as dust, fiber, water, and more from people, surfaces, components, or work environments. Finally — you can get air gun performance without the danger of compressed air! This system also uses far less energy and emits far less noise than its compressed air counterparts. 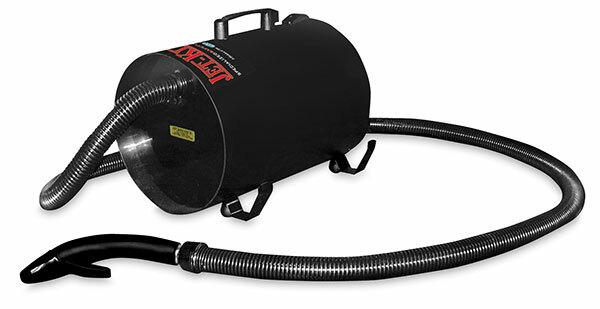 Jet-Kleen’s blower-driven system delivers a high volume of air at a relatively low pressure — only 2.3 PSI — well below OSHA standards. The lower pressure means that even direct contact with skin poses no hazard (always use caution). The foam-insulated interior ensures low noise levels: maximum 78 dB. A heavy-duty plastic body ensures long-lasting operation and includes a flexible, heat-resistant hose that allows easy control of the air gun nozzle and retains its flexibility in all workplace environments. A holster holds the nozzle when not in use, and a stainless steel clip allows for easy removal of the hose from the unit. The Jetblack is ideal for studio and classroom ceramics, clay, woodcarving, and metalworking environments. ® AWT is a registered trademark.™ Jetblack is a trademark.